When Laurel Lewis got pregnant, she began developing several small growths on her back. Concerned about what they could be, she made an appointment to see her GP. The GP quickly reassured Lauren, who didn't want her real name used, telling her the growths were nothing dangerous. In fact, they were actually completely benign, although they looked unsightly – to Lauren at least. “She said they were seborrheic keratoses, which are also known as middle-aged warts, which isn’t a very nice name!” said Lauren, now 47, who is a university lecturer based in London. When Lauren got pregnant for the second time a few years later, she developed even more of the keratoses. “I had been to the hospital and had two large ones shaved off, as they were itchy and bothering me, and thought that was the end of it. “Then, very quickly in fact, I developed more. I went back to my GP who said they usually caused by genetic factors, but are often exacerbated with hormones, which means that my pregnancies could be setting them off. But when Lauren got pregnant for the third and last time, her skin went haywire. “I suddenly developed a lot more, this time not only on my trunk but also on my neck. That made me feel very self-conscious. “I also had quite a few seborrheic keratoses underneath my breasts, where my bra fastened. They began to itch and hurt a bit when I wore my bra, so I made an appointment with the GP to get a referral to have them removed. Because of their appearance, seborrheic keratoses can mimic the appearance of melanomas, or dangerous skin cancers. A melanoma may turn black, change colour completely or bleed, which is a sign it’s potentially dangerous. 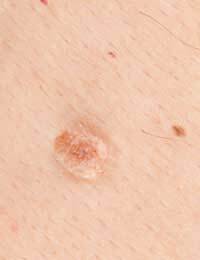 But a seborrheic keratosis, when irritated by something like a bra strap, can do the same thing. “When I went to the hospital the doctor said they weren’t sure what they were removing, and so she wanted to do a biopsy on a big ‘wart’ on my back that had been constantly rubbed by my bra and looked sore and darker than the others,” Lauren recalls. “The word ‘biopsy’ suddenly set off alarm bells, and when she was done I phoned my husband in a panic. Lauren was on tenterhooks waiting for word from the hospital about the biopsy. “By the time the letter came saying everything was all right, I just broke down,” she says. Lauren was told to keep an eye on the keratoses in case they really were something else, and to report back to her GP in case anything looked dodgy. And if any were especially itchy or uncomfortable, she could make an appointment to have them removed, although the NHS wouldn’t remove one for purely cosmetic reasons alone.